If you import the demo content and are using the existing contact form please make sure you enter your email address in the contact form’s edit screen and edit the “Message Body” to include your site name. If you encounter a bug in the theme or have any pre purchase questions you can get support by posting your issue or question on the item’s comments page. When posting responses to your post please use the “reply” button on your original post so your conversation is threaded. This makes it easier to follow. The WP Customizer allows you to configure your site quickly and easily with a live preview of the changes as you go. To speed things up even more there are four colour scheme presets you can use as they are or as a base for your own colour scheme. 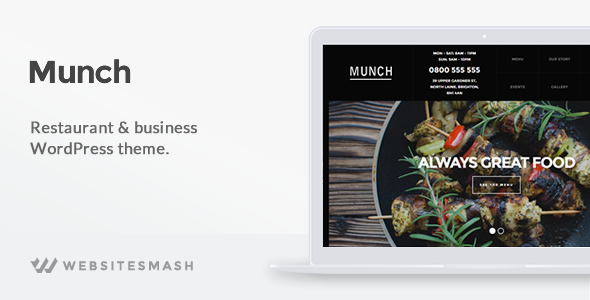 Whether your visitors are viewing your site using their smartphone while on the move or using their desktop computers at home, Munch always looks great. The extensive colour and typography options allow you to tailor the look and feel of your site to match your brand perfectly. All options are presented in a user friendly manner in the theme options panel. The Funky Shortcodes plugin includes some simple to use styling shortcodes to give your content a little extra punch. Shortcodes are easily accessible on the page edit screen via the Visual and Text tabs on the content editor. Munch includes schema.org mark-up used by search engines to improve the display of search results, making it easier for the right people to find your website. Not only will your site be found, visitors will have immediate access to the important information they want to know. It’s the most popular trend in web design. 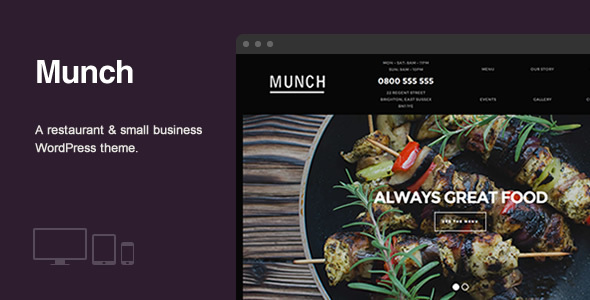 Munch includes some subtle scrolling effect to give the polished and professional look your business deserves. You’ll find a 2000+ word documentation file included with the theme that will take you, step by step, through all the common tasks you might need to perform in order to get your site up and running. If you get stuck you can count on reliable and fast support from an Elite ThemeForest author with more than 7,500 happy customers. 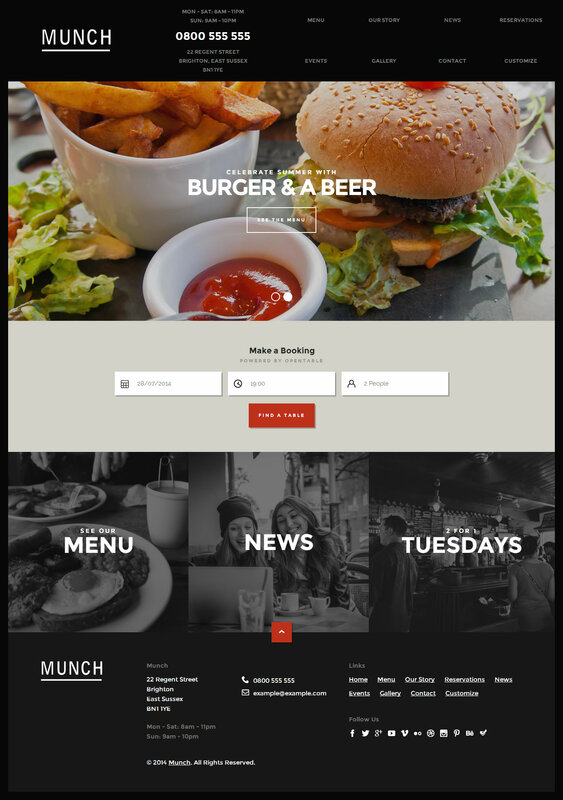 Munch includes shortcodes to integrate the popular Bookatable reservation systems into your site. The shortcode include a content editor buttons and a popup window to configure the shortcode. Turn any page into a quick and simple menu using the menu shortcode. 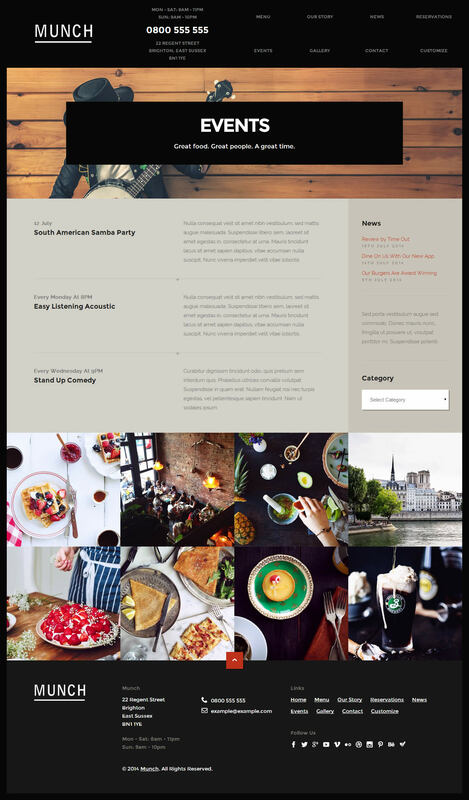 The shortcode is designed to be easy to use but produce an eye catching menu page. You can change the font of just about any text that appears on your site from within the theme options. With more than 600 Google fonts to choose from and every font styling option available, you can get your site text looking exactly how you want it. Drive traffic between your Instagram feed and your website by including your latest images at the bottom of any page. Display the great food you serve and show everyone the fantastic atmosphere your customers enjoy. Well documented – 2000+ word documentation file. Moved Google Map API Key option from theme options to page edit screen. Added commas to header address. Replaced “Map Address” template option with “Lat,Lng” template option (no longer uses Geocoding). Added custom WPML Language selector. Applied custom thumbnail size to Footer gallery. Limited size of home template grid box background images for improved performance.